Each $62 box contains 10 packs. Each pack contains 29 cards. 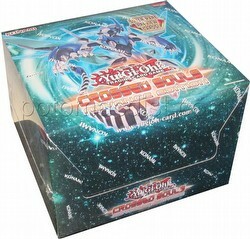 Each box contains 10 Crossed Souls Advance Edition packs. Each Advance Edition pack contains 3 Crossed Souls booster packs, 1 of 2 Super Rare cards of Common and/or Rare cards from Crossed Souls, plus 1 of 2 foil version preview cards of non-foil cards from the next booster set.